Home Lanka’s poor fielding: is it due to surplus of wicket-keepers? 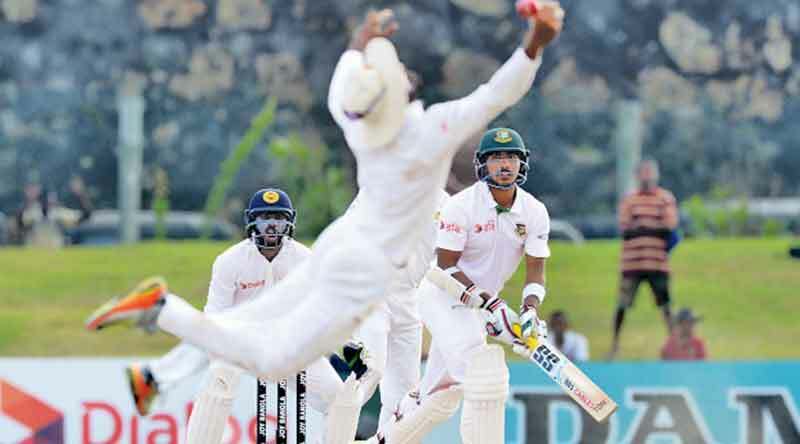 Lanka’s poor fielding: is it due to surplus of wicket-keepers? Is Sri Lanka’s key fielding problem due to the surplus of wicket-keepers in the team? This was a moot point that was raised the Daily News reliably learns at a meeting of the Sri Lanka hierarchy with the national team cricketers and key support staff that took place on Tuesday night at the end of the two-Test series against Bangladesh. The series was drawn one-all with Bangladesh securing their maiden Test win over Sri Lanka in 18 Tests at the P Sara Oval, venue of the second Test. Sri Lanka had taken an early lead in the short series by winning the first Test played at Galle. One startling revelation that came to light was that Sri Lanka had so many wicket-keeper batsmen in their team and this could be one of the reasons for the poor fielding standards that we are experiencing today. In the past two years the Sri Lanka team has comprised of cricketers who are also wicket-keepers namely – vice captain Dinesh Chandimal, Kusal Mendis, Upul Tharanga, Niroshan Dickwella, Kusal Perera, Kaushal Silva, Sandun Weerakkody and Chamara Kapugedera in all three formats of the game. Naturally the selectors pick these players purely for their batting but there is a minus factor to it because they are not natural fielders. Having begun their careers at school as wicket-keepers and some of them having to keep on switching from wicket-keeper to a normal fielding position like for example in the case of Chandimal, surely the fielding standards have got to drop. Sri Lanka could easily be the national team in contemporary cricket with the largest number of wicket-keeper batsmen in their playing eleven. When Sri Lanka won the cricket World Cup in 1996 they had three wicket-keeper/batsmen in their 14 namely Romesh Kaluwitharana, Hashan Tillakaratne and Asanka Gurusinha, but the standard of fielding was so high that they compensated for whatever shortcomings there was in the bowling. Wicket-keeping is a totally different specialist’s position and does not require so much of movements around the ground because the wicket-keeper’s job is to stand behind the wicket at each end whereas a fielder is expected to be able to play in any position he is asked to and also chase balls to the boundary line and back. He is expected to run and take high catches in the outfield as well as stand at close-in and snap up sharp catches that require sharp reflexes. If one was to analyse and see why Sri Lanka was at the receiving end of Bangladesh in the second Test you can easily point it out to poor catching. Two of the offenders were Dinesh Chandimal fielding at deep square leg and Upul Tharanga at deep mid wicket – both wicket-keepers. Chandimal’s catch was a dolly one which should have been held nine times out of ten. But more than his catch it was the one that Tharanga missed off Shakib Al Hasan when he was on 11 that proved costly. Bangladesh then 210-5 would have easily been six down for that score, but the miss saw Shakib take the total to 421 before he was finally dismissed for 116. The first innings lead of 129 that Bangladesh gained proved decisive to them in the end. How Sri Lanka can address this trend is left to be seen. The funny side of it is that they have hired a wicket-keeper/batsman from South Africa Nic Pothas to uplift the fielding standards when the surplus of wicket-keeper/batsmen in the national squad has been identified as one of the main reasons for the drop in fielding standards. Pothas was at one time regarded as the best wicket-keeper in South Africa and he vied for a place in the national team with Mark Boucher who finally edged him out. Since then he has been playing county cricket for Hampshire and most recently been the academy director at Leicestershire County, and was the cricket director at Guernsey in the past.